You will pass Food City & Big Lots on your right. When you get to the Kroger you will need to turn right onto Gill Street. Follow Gill Street until you see Taco Bell. Turn right on to Calderwood Street. Our office will be a couple of blocks up on the right in the Midland Professional Building. Our address is 241 Calderwood Street. The Midland Shopping Center will be on your left, we are on the right beside Noble Finance, in the old ETHRA space) Behind the old Subs & Such restaurant. When you see Walmart on your left and Cracker Barrell Restaurant on your right you will need to turn there, this is Calderwood Street. Continue up Calderwood Street until you see Wendy's on your right (in front of the Midland Shopping Center). Our office is across the street in the Midland Professional Building. Our address is 241 Calderwood Street. We are on the right beside Noble Finance, in the old ETHRA space, behind the old Subs & Such restaurant. Take US-321 East until you come to Alcoa Highway, US-129. Turn left onto Alcoa Highway US-129 and follow Alcoa Highway toward Knoxville until you see Walmart on your left and Cracker Barrell Restaurant on your right. You will need to turn right there, this is Calderwood Street. Our office is across the street in the Midland Professional Building. Our address is 241 Calderwood Street. zens Bank and walk up the sidewalk; we are in Preservation Plaza on the 5th floor. Turn left at Kroger onto Gill Street. Follow Gill Street until you see Taco Bell. Turn right onto Calderwood Street. Our office will be a couple of blocks up on the right in the Midland Professional Building. Our address is 241 Calderwood Street. The Midland Shopping Center will be on your left, we are on the right beside Noble Finance, in the old ETHRA space) Behind the old Subs & Such restaurant. 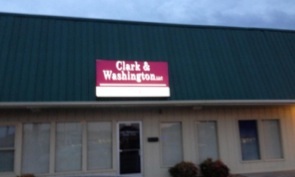 � 2003-2008 Clark & Washington, P.C. Disclaimer: This Website contains general information about various areas of bankruptcy. should consult with an attorney.